A few months ago, none of these children were wearing uniform. In fact none of these children were attending school at all. 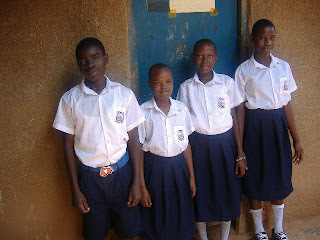 But thanks to Kids Club Kampala; Ivan, Swabura, Dorcas and Immaculate are all now going to school. All these children are being sponsored to go to school by individual Child Sponsors, through our School Sponsorship programme. Without a Sponsor, these children would not have the opportunity to attend school, receive a good education and grow up having hope for a bright future. Education is a vital tool to overcoming poverty and makes a real difference in a child's life. We currently have 23 children being sponsored to go to school through our School Sponsorship programme, and we would like to say a huge thank you to all of our Child Sponsors who are making a huge difference in these children's lives. However, there are still many children that we work with who do not have the opportunity to go to school. If you would like to help make a difference in a child's life through giving them the gift of an education, then we would love to hear from you. Please email info@kidsclubkampala.org and we can send you more information and a sponsor form. Thank you. Older PostVital Donations for the children - thank you!